This Smoked Duck with Hoisin Sauce Pizza Recipe is inspired by a Peking Duck Pizza that I used to order at California Pizza Kitchen (CPK). Smart Flour Foods reached out to me about their gluten free pizza products and sent me some coupons to try their products. Since one of my sons cannot have tomato, I created a pizza using hoisin sauce instead. 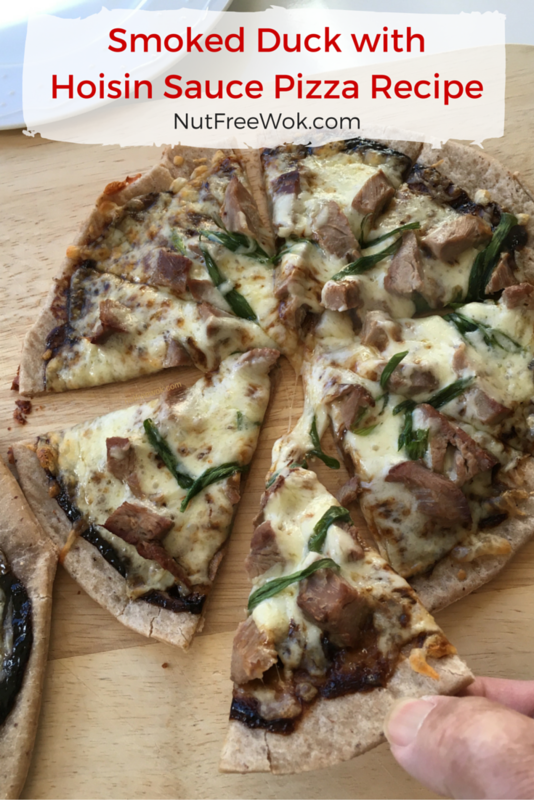 Our family loved the Smoked Duck with Hoisin Sauce Pizza and I’m sharing this Asian inspired recipe with you. It was easy to make once I had all the right ingredients at home at the same time. Disclosure: I received coupons to purchase samples of Smart Flour Food products. All opinions are my own. Most friends can enjoy dinner and then a show together and we tried to do that with friends during a snow getaway to Reno. We checked with every restaurant at the hotel and either they couldn’t seat us before our show or we were concerned about their use of nuts or peanut oil. We resorted to checking the fast food options and while they were safe for our kids, our friend could not find anything gluten free. In the remaining 30 minutes, we resorted to snacks in our rooms and made it to the show. As a result, I often think about what would I serve if this friend came to our house for dinner. I try to understand what it means to be gluten free, dairy free, etc. 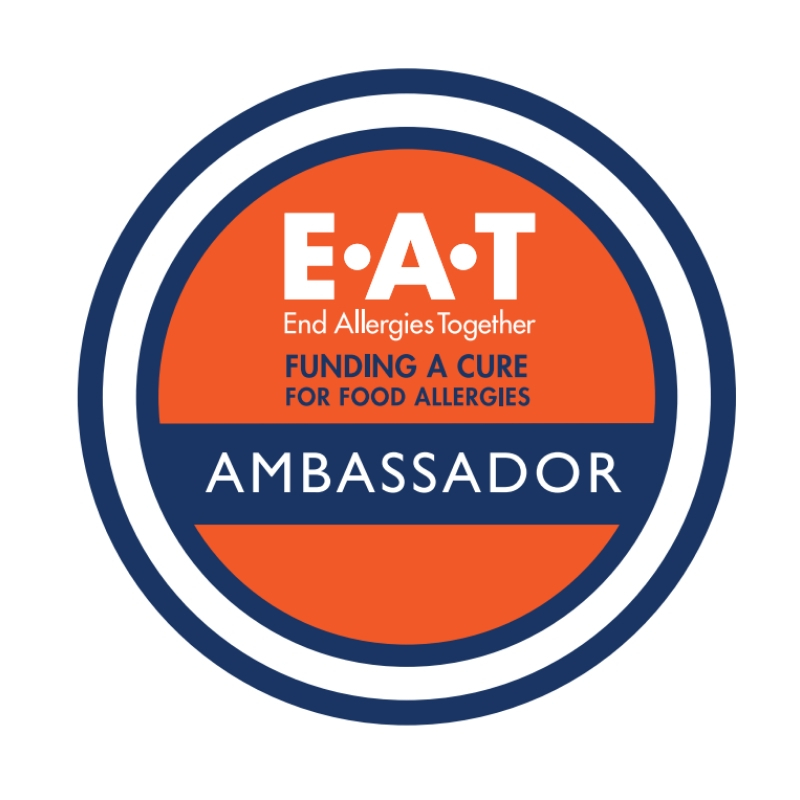 so that I can be a gracious hostess and compassionate bystander to the friends with allergies different from ours. 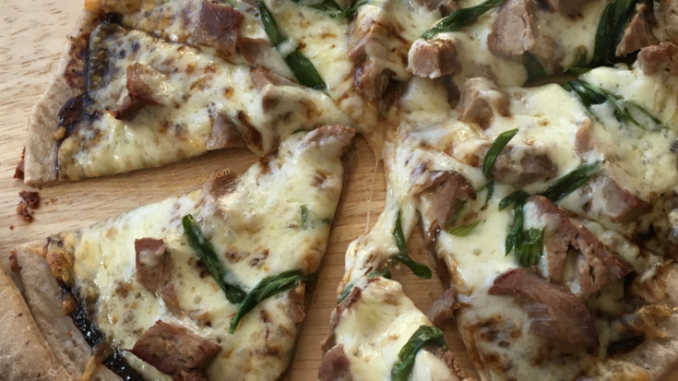 Next time they come over, I will be serving this Smoked Duck with Hoisin Sauce Pizza for them. 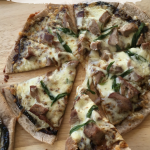 You can make your own delicious Smoked Duck with Hoisin Sauce Pizza in minutes because the recipe is so easy and fast. The hard part is selecting allergy safe ingredients. Start with a premade crust that is safe for you. I used Smart Flour Foods gluten free crusts which are made in a facility which does not use any of the top 8 allergens. Use a spoon or a pastry brush to spread a small amount of an allergen safe hoisin sauce. I usually use Lee Kum Kee’s hoisin sauce but ran out. Lee Kum Kee also makes a gluten free hoisin sauce. My local Whole Foods carries a brand called Wok Mei (gluten and nut free, per email) but not the hoisin flavor. I ended up using a hoisin sauce by Dynasty, which I do not recommend because it tasted “spicy” to one of my sons. The hoisin sauce by Dynasty does not indicate any allergen advisories on the label but per an email their hoisin sauce is made on shared equipment with nuts and gluten. Add thinly sliced or shredded pieces of pre-cooked duck. 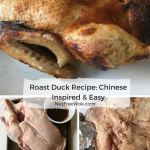 I’m always hopeful we would have leftover roast duck but it never happens. Finally I found some smoked duck breasts at Whole Food’s refrigerated meat section that are ready to heat and serve. They were tender, moist, and flavorful. I used a smoked duck breast by Mary’s Free Range Duck. You can also substitute with shredded pieces of rotisserie chicken or smoked tofu slices if you don’t eat duck. Sprinkle thinly sliced scallions and a handful of shredded mozzarella cheese (use what works for you) and bake until the cheese is melted and bubbly. Eat. It took me less than 30 minutes to make these pizzas from start to finish. I have sampled Smart Flour Foods at the Gluten Free Allergen Free Expo as well as at the Winter Fancy Food Show and I made the cheese & margherita pizzas for my family. The cheese pizza is very nice, the thin crust stands up well to the sauce and cheese. The margherita pizza also has a thin crust but it also has a lot of sauce and tomatoes, so the pizza was softer and too messy to eat with fingers. I recommend that if you like a crispy thin crust pizza to adjust the timing and temperature accordingly or bake with a preheated baking stone. Their frozen pizzas are free of wheat/gluten, egg, soy, and rice and per an email, “The Smart Flour Foods facility is not certified as nut-free. However, all of Smart Flour Foods’ ingredients are nut free and no nuts or tree nuts are processed in the company’s facilities.” Sounds good enough to me! Pay attention to the pizza crusts. Each pack comes with 2 pizzas and are free of gluten/wheat, dairy/casein, eggs, soy, nuts, and rice. 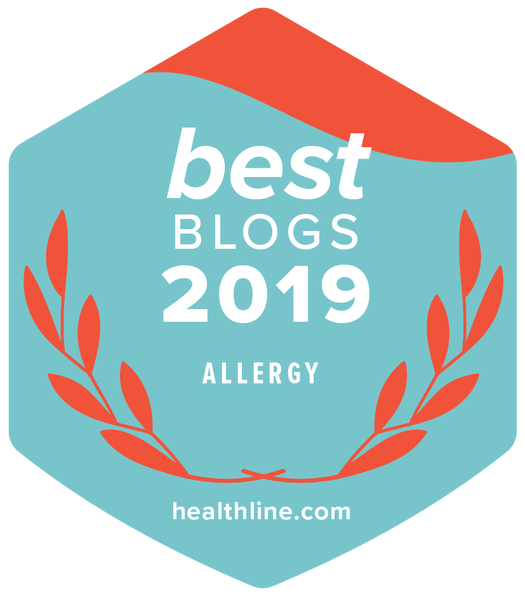 That eliminates many of the top 8 allergens and can’t imagine that they would be processing fish or shellfish either (check if you have concerns). These pizza crusts are perfect for our family so that I can make tomato free pizzas for our entire family to share and I can control how much sauce to use to optimize the texture of the crust. One of my sons feels better when he eats gluten free so making our own pizzas with a frozen crust is a nice alternative to pizza delivery. My local readers may be interested that I can only find these pizza crusts at the Whole Foods in Redwood City but not at the San Mateo store. 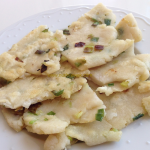 This recipe as written is free of peanuts, nuts, gluten, soy, shellfish, fish, and egg. The Smart Flour crusts are dairy free too and you can substitute with an allergen safe dairy-free cheese if necessary. Check what is in my cupboard for ingredient ideas. Preheat oven according to package's instructions (I have a conventional oven, 400F). Prepare a large baking sheet by lining with foil and prevent sticking with non-stick cooking spray or a sprinkle of corn meal. Place the crusts on the baking sheet and use a spoon or a pastry brush to spread the hoisin sauce on the crust. Remove the skin from the duck breasts (discard or reserve for other use), thinly slice the duck breast or shred by hand into bite sized pieces, place on the pieces on the pizza crusts. Thinly slice the scallions diagonally and sprinkle over the pizzas. Bake in the oven according to instructions on the package (I have a conventional oven, 13-15 minutes) until the cheese is melted and bubbly. When the pizzas are ready, transfer them to a cutting board and wait 1 minute to allow the cheese to set. Slice and serve (I like to slice with a large cleaver). If you like a crispier crust, either a) increase the oven temperature to 425F or b) bake on a lower rack or c) use a preheated baking stone. Be sure to start watching the pizza after 10 minutes or when your kitchen smells like pizza! 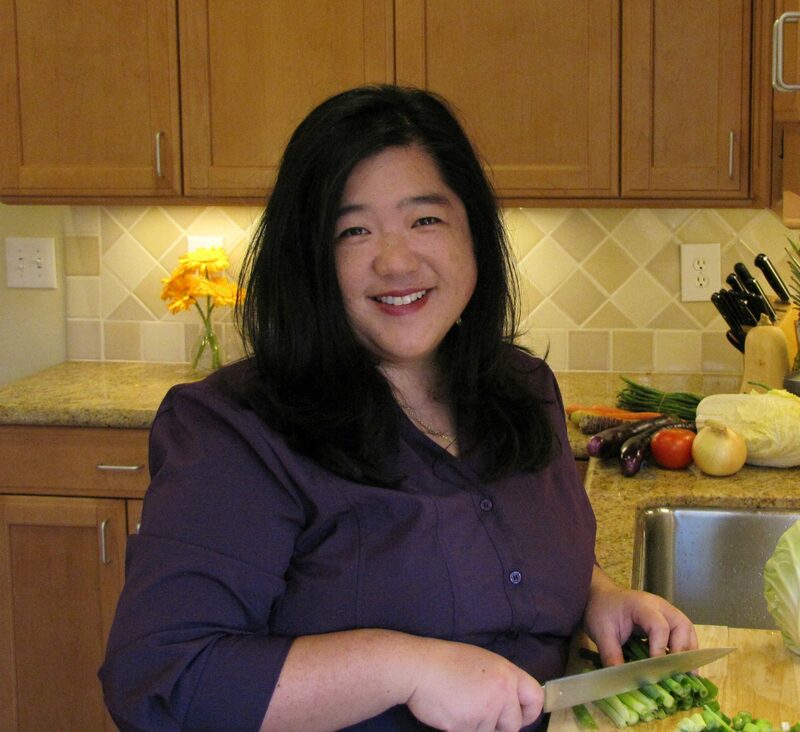 The best way to see every post or recipe is to subscribe to Nut Free Wok’s email subscription (be sure to respond to the confirmation email). You will to be notified by email next time I publish another post or recipe and I won’t send you spam or share you email with anyone. 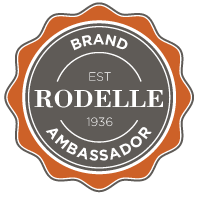 In addition to receiving coupons for Smart Flour Foods, I may mention the names of stores and/or brand names of products that I use. I have not been paid or solicited by any of the above companies to mention them. I share products and sources which I use and think may be helpful to readers, all opinions are my own. Please note that manufacturing practices and ingredients can change at anytime without notice and readers are always responsible for assuring allergen safety before buying or consuming foods. NutFreeWok.com is a participant in the Amazon Services LLC Associates Program, an affiliate advertising program designed to provide a means for sites to earn advertising fees by advertising and linking to Amazon.com. What a unique topping idea Sharon! I’m always looking for flavorful pizza toppings. Aha! I have a smoked duck breast in my freezer right now! I’ll have to try this soon. 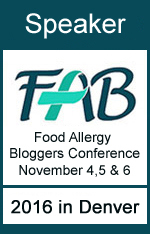 I’m not GF nor do I have any food allergies, but it’s good to know how to make this both ways. Also glad to know Whole Foods carries smoked duck breast. Finding the duck was probably the most challenging, but you’re all set. 🙂 Thanks for taking the time to visit and leaving a comment. Sharon, you are such a super creative lady! I love your pairings on this pizza! Thanks for your smart flour review! This is such a fantastic idea for a pizza. I absolutely love this and cannot wait to try! Ooooh. I’ve never had duck OR hoisin on pizza, but now I’m intrigued!! Sounds tasty! 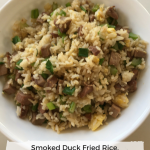 Hoisin and duck – what a great combo! I bet this is soooo good! I’ve always wanted to give Smart Flour Foods a try. Thanks for the review. I’m better with gluten these days so I do eat some gluten BUT I’ve acquired a taste for gluten-free baked stuff, especially if they are made with whole grains. Done well and with the right ingredients, gluten-free bakes actually have a lot more character in flavor. Hi Christine, we’re in the same boat as you regarding gluten, maybe there’s some gluten intolerance, I can’t figure it out. Definitely having some variety in our diet helps in many ways. I really am in love with the Smart Flour crusts, I bought some more this week because they’re on sale at Whole Foods. 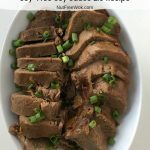 Let me know what you think of them after you try this recipe. Have a great day!!! It’s a classic SE Asian ingredient combination. On a pizza I would say this would be great. What a tasty recipe. My son has Celiac Disease and we keep the house GF to make it easier. I will check into this crust for sure! I think you’ll really enjoy the Smart Flour crusts, then you can customize it with your own creative combinations of ingredients. Must smoke some duck soon! Maybe two! I see I need some leftovers cause I really want try this pizza! Must be heaven on a plate!! What a creative recipe Sharon! Those pizza crusts sound great and I love that they have a gluten-free / dairy-free option – that works for our home! This pizza looks great. I’m usually a traditional pizza kind of girl, but this looks yummy! This looks like a great pizza recipe!